This is my Little Gracie set up in our new conservatory, in our new home, a flint and pan tiled cottage in Thetford. I bought the Gracie back in December, but what with the move and other things, we've only just got it put together - it was like a giant meccano set - which my husband enjoyed putting together! 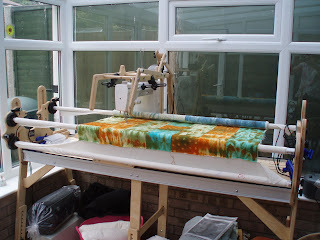 The fabric was dyed in the microwave and I had done some handstitching on the quilt but didn't like it. I found it again when we moved anf thought it would be ideal for practicing on the Little Gracie. I'm coming along quite well [!] 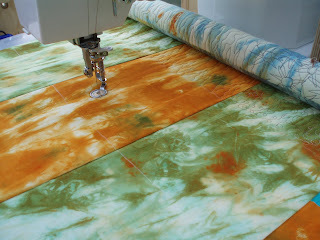 it is a different way of machine quilting as I am used to moving the fabric under the needle, but now I have to move the needle over the fabric. The hope is that now I can concentrate on some new work which I am itching to do. I have lots of ideas and not enough time! For those of you waiting for the new book, which we had hoped would be published in time for the Festival of Quilts, it should be out in time for The Knitting and Stitching show. The publisher's father has been ill.